The Lake House is a truly gorgeous dining room, and the location is all kinds of cliché, nestled on a calm, picturesque lake. We were there for lunch, and it was more formal than our meal at Mercato, which was not surprising – it really does strive for that high end dining experience. White dominates the interior décor, accented with taupe and flirty splashes of lime cushions. Light streams in from all directions showcasing the magnificent floral displays and striking artwork. Every angle provided clear views of the surrounding flora – I am so glad we visited on a glorious summer’s day to make the most of this (and we didn’t even choose to sit outside!). The standard of the meals met all of our expectations. The range of choice for the vegetarians in the party was ample enough, with interesting and inventive options on offer. The two entrées chosen were: the tempura tofu, yellow bean paste, Asian salad; and the Burrata, young fennel, broad beans, parmesan, wheat grass, fennel veloute. This was followed by the goat curd tortellino, summer vegetables, Mt Zero lentils; and the Summer harvest – vegetables, herbs, flowers and grains, 63 degrees C organic egg, white polenta. I couldn’t go past the peanut butter, black sesame, caramel, banana for dessert – absolutely delicious (and I’m not a huge dessert fan!). The choice of wine was nearly as difficult a decision to make as the food itself, but we think we scored with the Mount William Jorja-Alexis Rosé, 2003 (Macedon Ranges) and the Best’s Great Western Bin 0, 2009 (Grampians). The service from all staff was smooth – patter in perfect cadence and just the right amount of banter, timing of delivery of all things (menus, aperitifs, courses, wine…) was spot on. Three hours passed in an instant and we begrudgingly had to leave. Next time, I think we may stay over night and check out the spa treatments on offer as well! 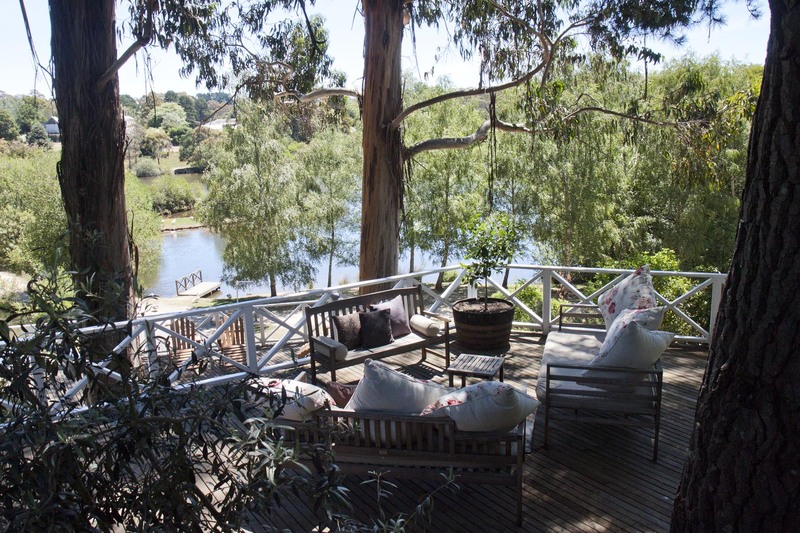 This entry was posted in Australia, Australia Restaurants, Restaurants, Victoria and tagged Daylesford, Lake House Daylesford, Macedone Ranges, summer lunch with friends, Victoria by bontaks. Bookmark the permalink.